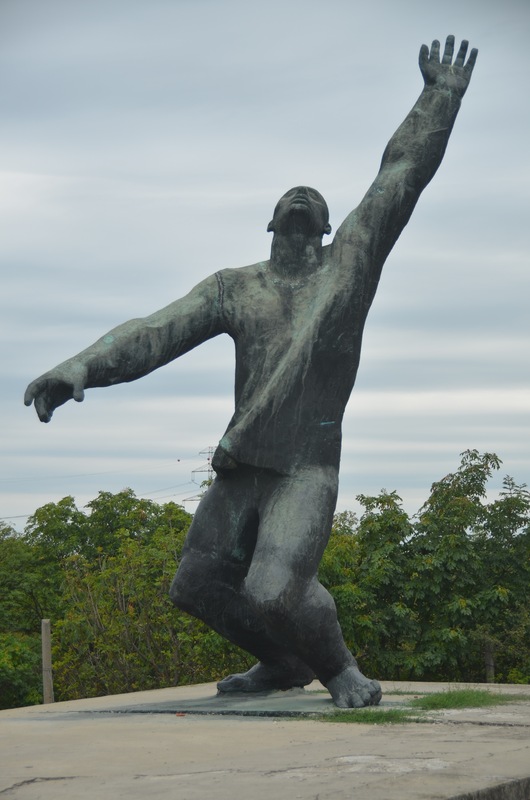 One of the most fascinating places we visited was Budapest’s Memento Park. 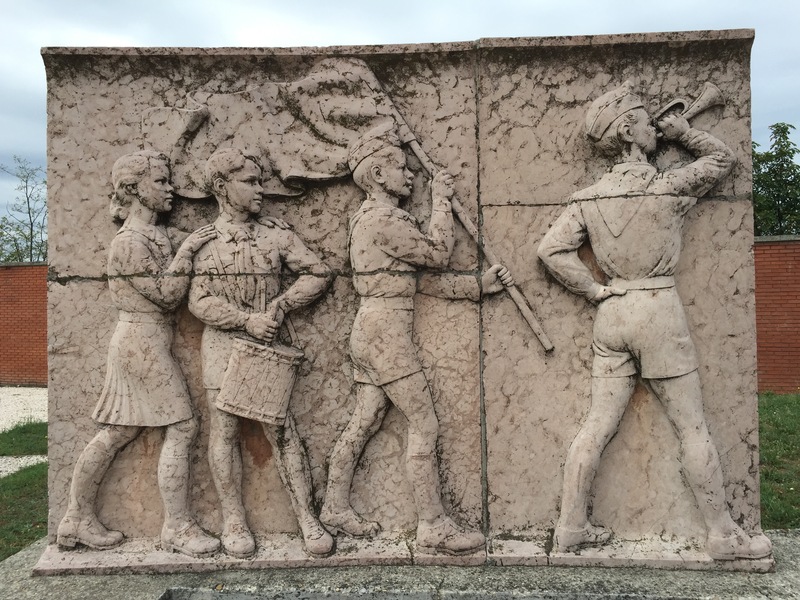 After the fall of the USSR, and finally, by 1991, when the last Soviet soldier left Hungary, the propagandistic art of the Soviets was rounded up and sent to the outskirts of town. Hungarians were not interested in being constantly reminded of their long occupation by letting the heavy, prosaic, Socialist Realist art stay where it was littered through Budapest. But they didn’t want to completely destroy it either. Instead, a young artist won a competition for his satirical design which included the displaced “Art,” but also made commentary on it as well. 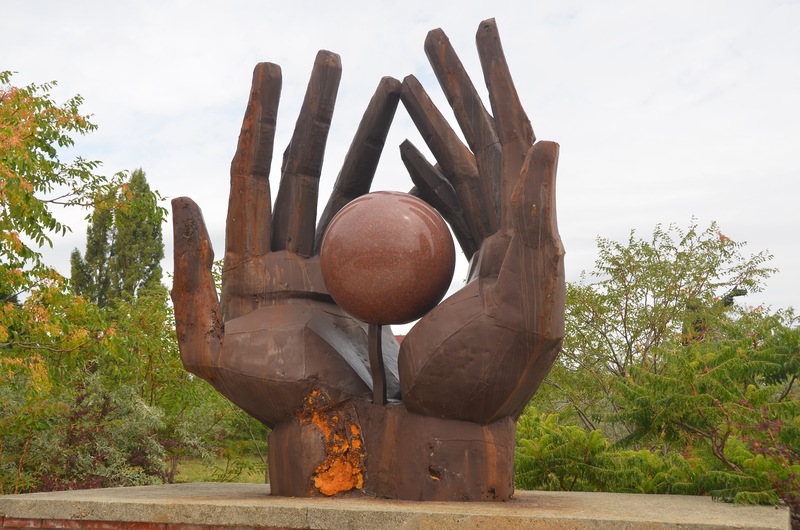 Memento Park now stands as a reminder of what once was a reality in Hungary from the end of WWII until 1991. 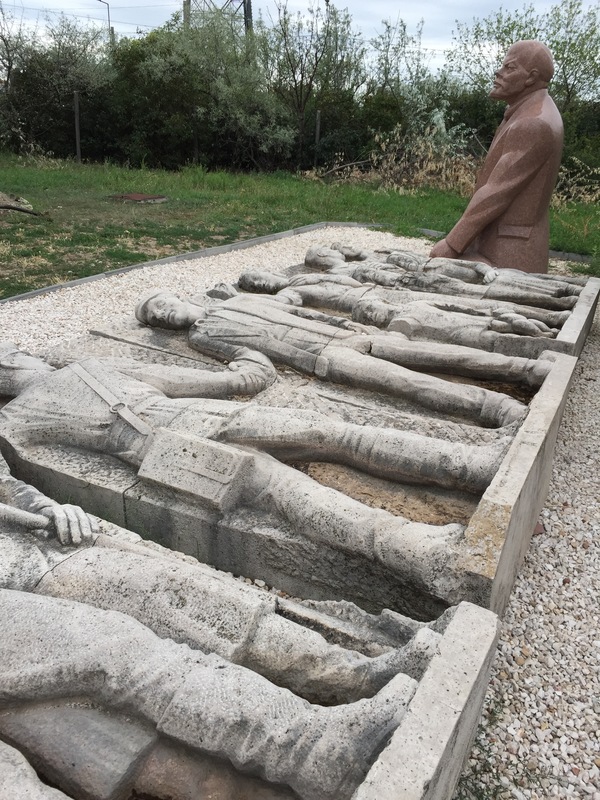 For many Hungarians, what they learn by visiting places like Memento Park and the Museum of Terror is shocking because the tales they hear do not align with what they were taught in school. As most know, what really happened in the USSR and what was “pretended” to have happened was rarely in agreement. Renaming streets, removing monuments, and rectifying history are just some of the things that Hungarians needed to do to reclaim their own nation back. An excellent example of this can be found in one of the most iconic monuments in Budapest. 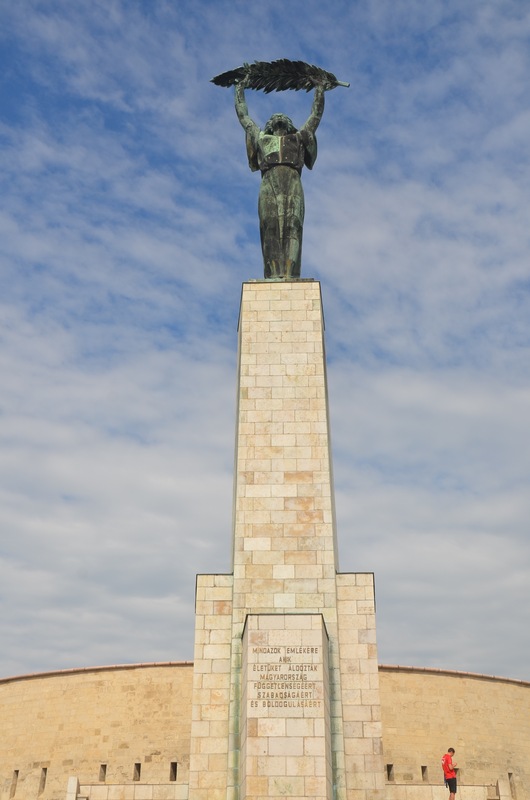 High on a hill, overlooking both Buda and Pest, stands a very tall monumental statue depicting “Liberty” as a woman who holds a palm leaf high above her head. She can be seen from everywhere in the city. During the Soviet occupation, underneath her, at the base, stood a massive Russian soldier holding an automatic weapon. No longer, however. 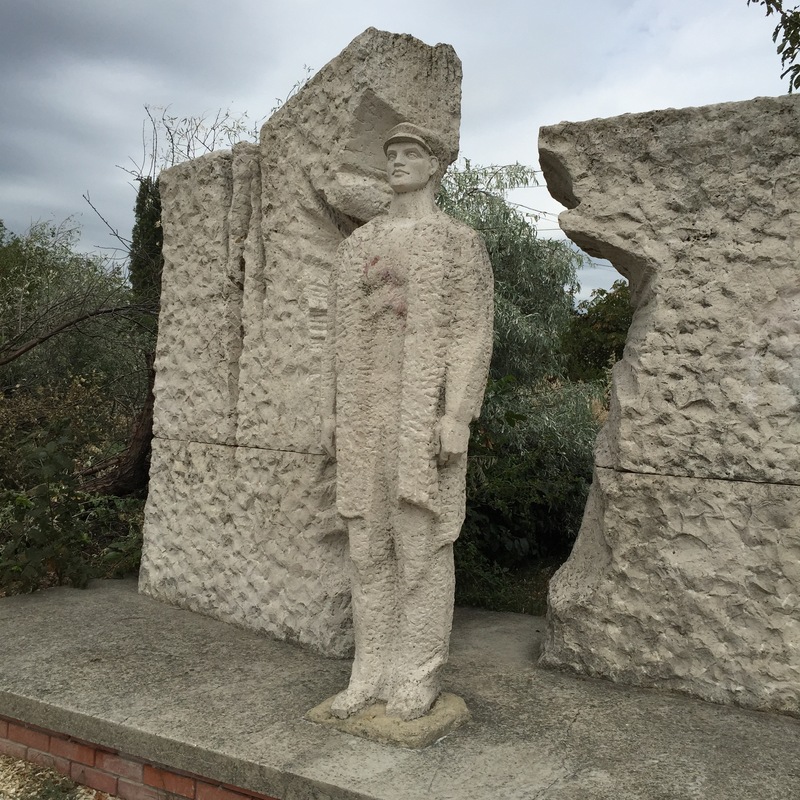 The soldier was removed and placed in Memento Park. 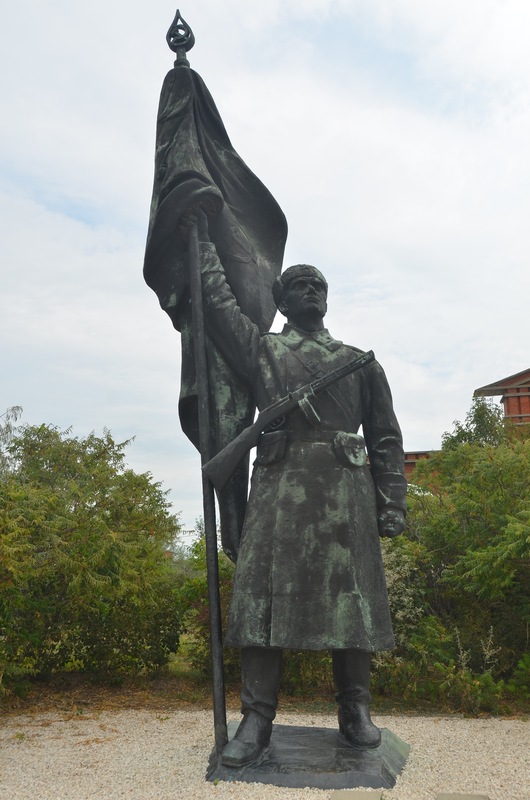 Here is the missing soldier, now standing at attention at Memento Park. The Hungarians felt the automatic weapon strapped across his body was grossly incongruous with the other statuary. 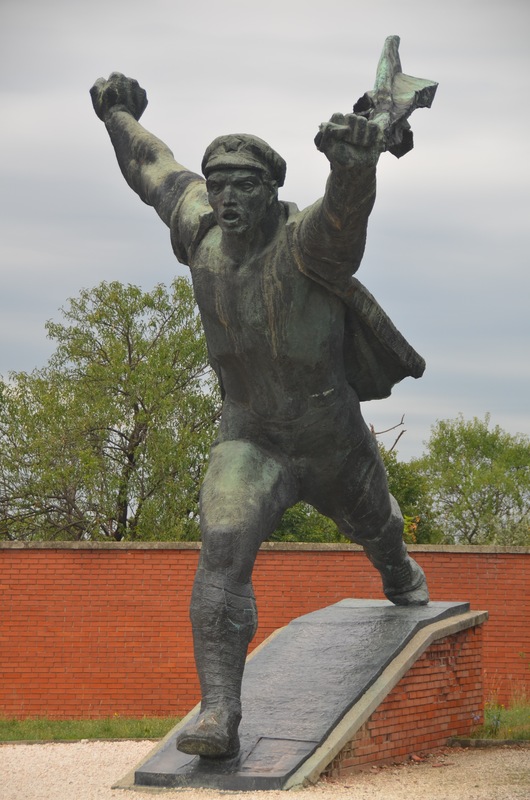 Notice the strong figure, the determined stance, and forward stride typical of a Socialist Realist depiction of an obedient and enthusiastic Soviet worker. But rather than just arrange all of the forgotten pieces, the designing artist used them to make an Anti-Communist statement. Here is where the symbolism gets a little involved, so I will just offer a few examples. In this piece, the relief sculpture that was was erect is now on its side, suggesting death. 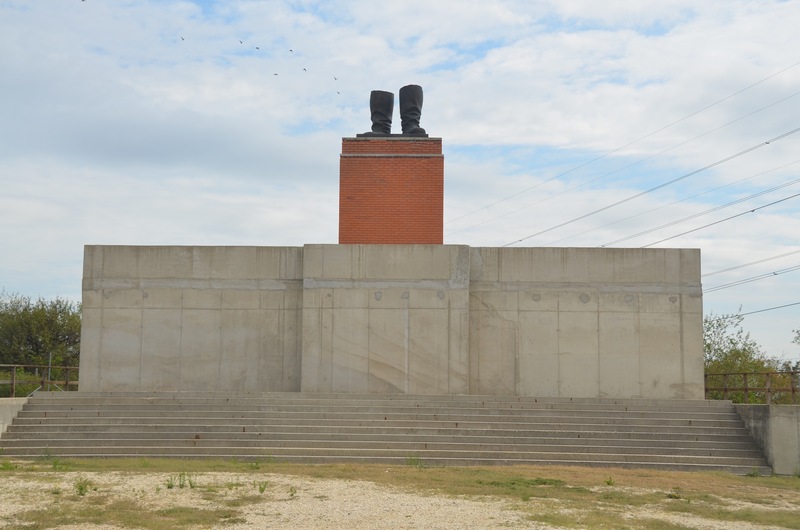 With Lenin sitting on one end–perhaps the death of communism? 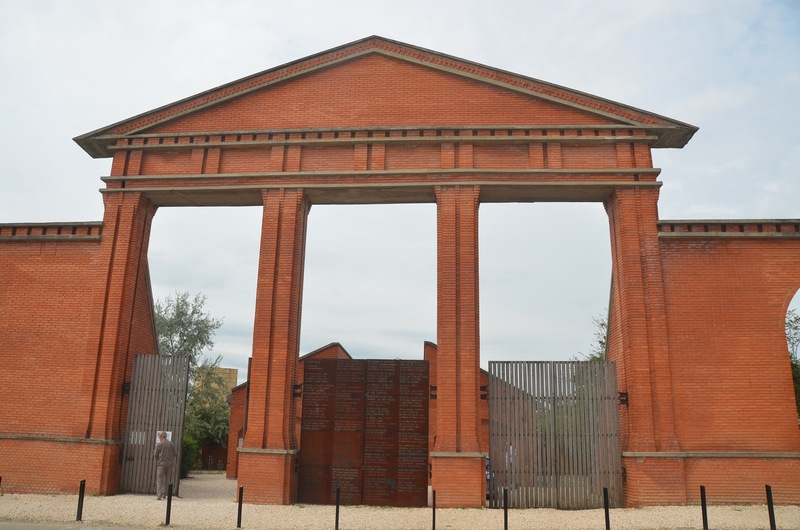 This is the gate into Memento Park. Notice how the main entry is blocked. This was the reality for most people in Communist countries. Their way was “blocked” by the party. The side door is open, perhaps symbolizing how in order to work the system (ie. get inside) you have to find an alternate path. The students also toppled a massive statue of Stalin in 1956. All that was left standing were his boots. Under communism, boy scouts and other such organizations without a political agenda were banned. Instead, children participated in “pioneer” programs, which this relief depicts. Sometimes the propaganda is subtle, sometimes it is overt. I have just given you a tiny sampling of this interesting place. We had a huge advantage because we went with a guide who explained it all to us, and who also had a driver with a van who could get us easily on the outskirts of the city. If you are in Budapest, don’t miss this insightful monument. If you don’t take a guide, be sure to purchase the book which explains the symbolism from the gift shop. If you just walk through it with no context, you won’t understand it. It is something that could be breezed through without thinking twice about it. I think the story of Central Europe is one that should be told more often. Let’s spread the word! I will be sure to visit when I finally get to Budapest. I am loving that you are posting about Budapest. Dave and I are going to the Czech Republic next summer (daughter is finishing her mission) and we were thinking of a couple other places to go also. Budapest is on our list. I’m loving following your adventures. Thank you! We go to Prague next!